PCW's wind engineer, left, outlines project details to a Rawlins city official. 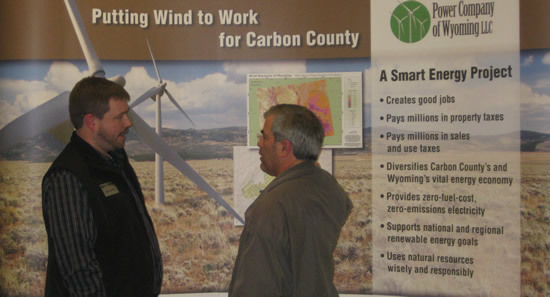 March 20, 2010 – Nearly 200 people from across Carbon County and the region attended Power Company of Wyoming’s community open houses, held March 17 in Saratoga and March 18 in Rawlins. The casual events were designed to allow citizens to stop by at their convenience, pick up information, ask questions, and simply learn more about PCW’s Chokecherry and Sierra Madre Wind Energy Project. The millions of dollars in estimated property taxes, sales/use taxes, and electricity taxes anticipated from the wind power project. Over 20 years, the estimated total taxes will equate to well over half a billion dollars going to the state, to Carbon County, to other Wyoming counties, and to incorporated cities and towns. Basic information about wind turbines, such as how they work and the careful planning behind their placement. An overview of the at least 114 permanent jobs and hundreds of construction jobs to be created. The permanent jobs would make Power Company of Wyoming one of Carbon County’s largest employers. An overview of PCW’s wildlife conservation plan for wind development and for ongoing operations on The Overland Trail Cattle Company ranch, where the wind project will be located. In addition, the PCW team circulated among the crowds – which included city, town, county and state employees; elected officials; ranchers; teachers; local business owners; and many other interested citizens – to explain various aspects of the wind project and to answer questions. “The majority of feedback from residents attending a forum Thursday was positive,” wrote the Rawlins Daily Times in a story published March 19. Hosting each event were the Platte Valley Community Center in Saratoga and The Depot in Rawlins. Stumpy’s restaurant, based in Saratoga, catered both complimentary barbeque brisket meals provided at the open houses.